My son is currently obsessed with BioShock. Not the shooting people to bits part, but the story, the characters, the music, and the world depicted in the game. BioShock takes place in 1960, in an alternative reality in which a businessman named Andrew Ryan creates an underwater utopia called Rapture. The story line involves a substance called ADAM, genetic mutation, Big Daddies and Little Sisters, and it is indeed compelling. For the most part, video games usually offer one of these two scenarios: 1. fire at a moving target and destroy it or 2. navigate through some sort of obstacle course. There have been occasional video or computer games that offer more than interesting graphics and effects, such as Myst and Beyond Good and Evil. Now, according to CEO Aunim Hossain featured on Galley Cat, games are taking the BioShock route toward more complex content, and therefore they’re going to need writers to develop plot and character. Although the fact that Ossain mentions Zynga threw me for a loop. Is Farmville going to feature, say, discontented cows and philosophizing farmers? Meanwhile, I have been obsessively playing BubbleShock. It takes place in this amazing underwater world in which a boy named Aquatic must save the Seven Seas by firing against an onslaught of bubbles in order to retrieve the magic pearls. 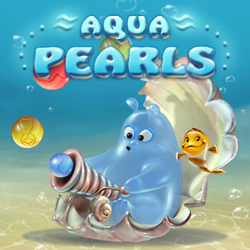 Well, it’s actually called Aqua Pearls and involves this little blobby guy shooting at what I assume are bubbles. But if the developers decide to bring in a writer to give this game more depth, I’m available. The war between Google and Facebook isn’t over yet. After vanquishing Myspace, Friendster, and Google’s ill-faring Orkut and Buzz, and not even letting Diaspora out of its corner to join the fray, Facebook is as firmly entrenched as the social networking site as Google is the de facto search engine. But Google isn’t down for the count—yet. Its latest attempt at outdoing the Facebook juggernaut is Google+. While it will have a News Feed-ish feature, Google+ will also act as a sort of news aggregator with an eye toward encouraging users to share content with friends. In an earlier post, I discussed how to create groups on Facebook to keep friends, family, coworkers, employers et al. separate from one another. Google+’s Circles feature handles this for you and gives you more control over how you share information. Galley Cat weighed in on how Google+ can benefit authors and publishers. I like Facebook. I have some wonderful Facebook friends. But it seems to me that interacting on Facebook somehow juvenilizes us, as though we morph into the college kids Facebook was originally created for. We LOL, ROFL, LMAO, WTF and FML and end every other sentence with an exclamation point or, worse, multiple punctuation and/or emoticons. Google+ strikes me as a Facebook for grown-ups and could be a welcome change of pace. If enough people decide to use it. On May 12 AllFacebook reported that “Unfriend Phobia Is Spreading On Facebook.” Apparently users are getting all hot and bothered over friends who are annoying the bejesus out of them. One of the first things I wondered about Facebook was how the hell do so many people have hundreds, even thousands, of friends? The answer, of course, is that “friend” is a bit of a misnomer; most of our so-called Facebook friends don’t even qualify as acquaintances. I’ve learned that there are two overriding principles about Facebook: 1. it’s competitive. Facebook envy runs rampant and the only way you can, well, save face if you don’t have many friends is to up your friend count by sending requests to anyone who remotely qualifies. And 2. Facebook is nice. As a veteran of Usenet groups where flaming was more the norm, I was struck by how goddamn sweet everyone is (case in point: Like but no Unlike buttons, apps that allow you to send friends rainbow unicorn posters or some such). Therefore, one can conclude that the friending process often involves one person with an unsatisfactory number of friends sending a request to another who is a sucker for not wanting to reject anyone, even if accepting the request goes against his or her better judgment. Most of these friends turn out just fine, but as AllFacebook points out, some will keep you up all night worrying that they’ll find out something about you that you don’t want them to know or that the next time you check your newsfeed you’ll have to suffer through yet another tiresome status update. The solution? Bite the bullet and unfriend them. I have a kinder, gentler method. Don’t want to read your neighbor’s Farmville updates or that self-aggrandizing author you’ve worked with’s less-than-inspiring quote of the day, every day? Click Edit Options on the bottom right corner and elect to hide their posts. Pestus eradicus! They no longer appear on your newsfeed. You can even bring them back if you really want to. Now, this works both ways. You may have friends who find your business advice boring or your passion for cats veering into crazy cat lady territory. What if—perish the thought—you’re someone’s definition of tedious and you might—heaven forbid—find yourself on the receiving end of unfriending? You can prevent this by creating lists, say, one called “business” for clients or coworkers, “ailurophiles” for fellow cat lovers, etc. Simply go to Accounts, then Edit Friends. This will take you to a list of all your friends with a convenient button on the top of the page that says Create a List. Click it and you get a box that prompts you to type in a name, then click on which friends you want to add. Click Create List when you’re done and voila! When you want to post that Schroedinger got a bit tipsy today rolling in some lovely ’nip and you’ve created a photo album to commemorate the event, click on the lock icon and then Customize to bring up the Custom Privacy box, where you can elect to share your post only with cat lovers and/or hide it from “business.” Your professional cohorts will be none the wiser. This system works so well that I shared it with one of my friends whose list has grown to an unwieldy over a thousand. Now her newsfeed is under control. And when she checked her friends list, she realized that she has no interactions whatsoever with several people to the point where she’d forgotten they existed. Yay! Not exactly Facebook’s raison d’etre, but I guess in real life we just can’t be that nice.